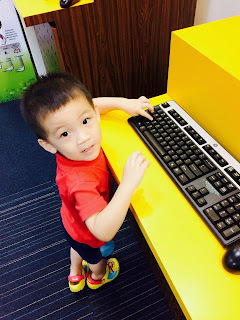 While we were at the library, Joram was fiddling with the keyboard at the title search counter. To my great surprise, he started pointing out the letters and numbers accurately to me. He has only been to school for 5 months and he could already know all the alphabets and numbers. This makes him the fastest learner among the kids. I'm so proud of him!